This earner understands the FOSS (Free & open-source software) & can administer, develop, test, release & license an Open Source application. They have extensive skills in PHP, HTML5, CSS, jQuery & Linux administration, & can develop and install Android applications, with expertise in multi-media, design, & modeling objects using various Open source 2D/3D tools. The earner understands the Business Models & IT applications across various domains & usage of Open Standards across industry domains. Must be a University student of a 4-year undergraduate program enrolled in the IBM Innovation Centre for Education Program. Minimum attendance determined by the University in all the semesters. Minimum marks for both Theory and Practical exams in all semesters, as mandated by the University. 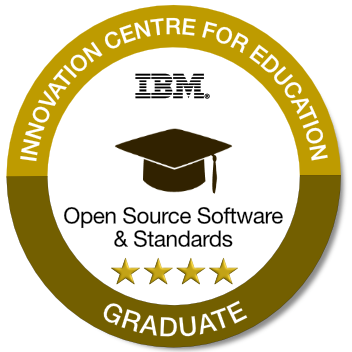 The minimum number of IBM specialization subjects completed should be 8. Completion of projects in the relevant semesters including an external internship with grades, as mandated by the University. All the above criteria to be verified by the University.